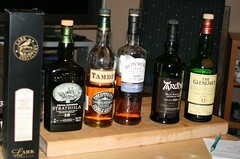 The whisky night went really well. So well, in fact that we almost drank all of the whisky! Five bottles of whisky between eight people is a pretty good effort in my book. A few of us got probably a bit too drinked, but it was a good night. Many thanks to the lovely Britt and Sara for doing the pouring! The favourites were definitely the Ardberg and the Tamdhu. A few people really liked the strong, smoky taste of the Ardberg, and those who enjoyed a more mellow whisky picked the Tamdhu as their favourite. The Tamdhu was a bit of a dark horse, as I'd never heard of it before I bought it from Dan Murphy's on Saturday, and it was quite affordable. The sixth, surprise whisky was a single cask single malt from the Lark Distillery in Hobart. I bought it when I was down there for a long weekend recently. 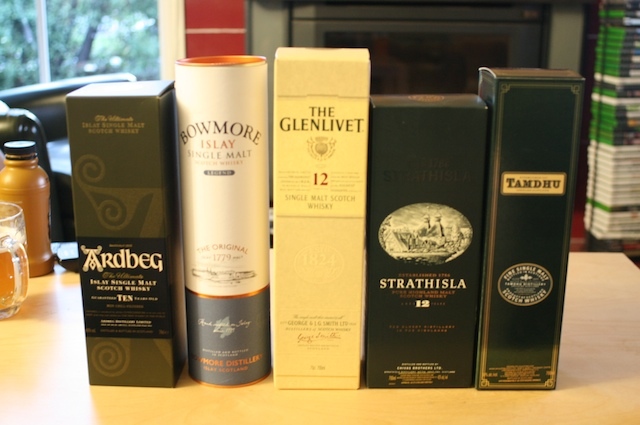 It provided a nice contrast to the scotch whiskies that we were tasting, and the quality compared to the scotch whiskies was very good. It has a very distinctive woody flavour to it, along with some vanilla / toffee.